A part of the Switch’s critical success can be attributed to Nintendo’s approach in making the console a new home for its beloved franchises. With games like Zelda: Breath of the Wild and Super Mario Odyssey, we can see how much more ambitious the Switch has allowed Nintendo to be when it comes to creating first-party games. This has led many to wonder what impact the Switch will have on the next mainline Pokémon games, set to release later this year. So after some careful digging, we’ve managed to uncover a lot of information regarding the next Pokémon titles, as well as some interesting rumors. We’ll be updating this story as more news is revealed, so make sure to check back. During E3 2017, we got a short announcement from Pokémon Company CEO, Tsunekazu Ishihara, saying that Game Freak had begun development on the next core RPG Pokémon title. 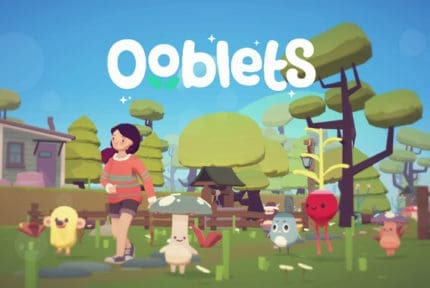 We’ve since learn that the game is slated to release in late 2019, which matches the recent trend of Pokémon games releasing in September-November. With no indication of any other big games coming to Switch during the fall season, its likely Pokémon will be Nintendo’s main focus. UPDATE: During a recent Nintendo Direct, the company announced that Pokémon Sword & Pokémon Shield will be coming to the Switch in late 2019. 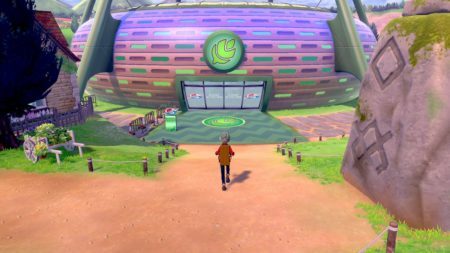 We now know that the new Pokémon games will take place in the UK-inspired Galar region, and will feature a variety of locales that includes small rural villages, bustling urban cities, icy mountains, mineral-rich caves, and huge arenas. 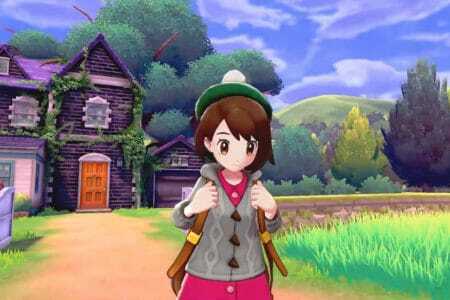 Pokémon Sword & Shield will also mark a shift in art style, with the new games taking on a cel-shaded look while maintaining the 3D perspective from more recent titles. Like every other mainline Pokémon game, Sword & Shield will feature new creatures to catch, including some that are exclusive to each version. 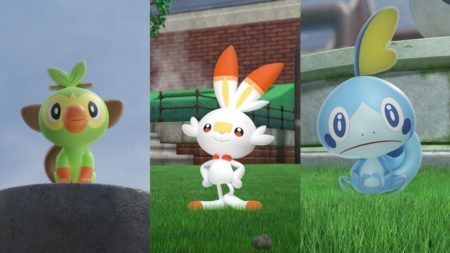 The three starter Pokémon players will be able to pick from at the start of the game are: Grookey (Grass type), Scorbunny (Fire type), and Sobble (Water type). 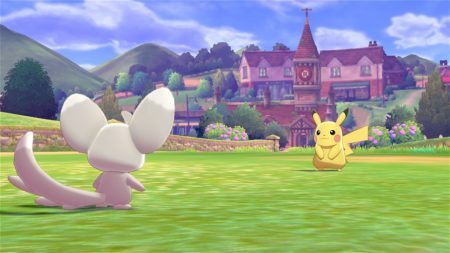 There are a lot of rumors currently circulating online regarding Pokémon Sword & Shield. Among these is a rumor that the new games will feature a redesigned capture system, which seems plausible given that Let’s Go were the first games to stray from the traditional catching formula. Additionally, it’s speculated that traditional Gym battles will be making a return to the series in favor of Trials from Sun & Moon. Other rumors have circulated that the games’ main antagonist is named “Kaesaru” and the evil organization you have to face will be called “Team Neon”. Lastly, it’s been suggested that the new games will include 106 new creatures and have a Solar System theme in the form of its legendaries, which sounds like a continuation of Sun & Moon’s story. Pokémon Sword & Shield Gameplay – What Could Be Changed? What’s probably most exciting to ponder is what the Pokémon Sword & Shield games will play like. If the capture system does in fact get reworked, could this mean a change for battling mechanics as well? With the Switch offering more horsepower than the 3DS, Game Freak could be looking into developing an open-world, where battles take place in real time and have your Pokémon moving around the battlefield while you shout out commands. 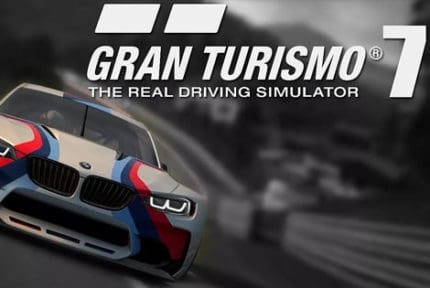 If this were the case, we could see the new games take-on a more non-linear story, one where you could have the entire region available at the start and be able to explore different areas at your own pace. NPCs could offer sidequests for you to complete in exchange for items, or maybe information on where to find a rare Pokémon. This approach would put an emphasis on exploration and lead to more organic interactions with Pokémon and trainers out in the wild. For a series with such a rich-history, it’s exciting to think about what the future for Pokémon games will be. The existence of the Switch has no doubt led Nintendo’s studios to search for ways to refine their tent-pole franchises, and much like Pokémon themselves, evolve for a new era of gaming. 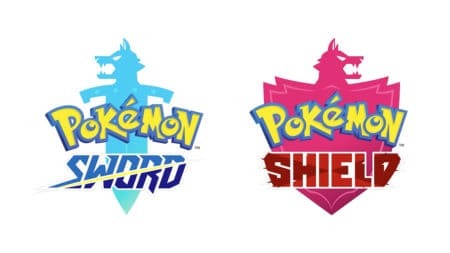 For now, all we can do is speculate what Pokémon Sword & Shield will be like as we anxiously wait to learn more information.